GRO is proud to introduce the Nashville, TN GRO Crew being the first GRO Crew to bring GRO to the girls of Tennessee! Calling all girls of all ages and abilities to join in the fun at this session! An opportunity for girls who are interested in or lovers of skateboarding, regardless of skill level to come together, grow, learn, engage and empower each other and their community. 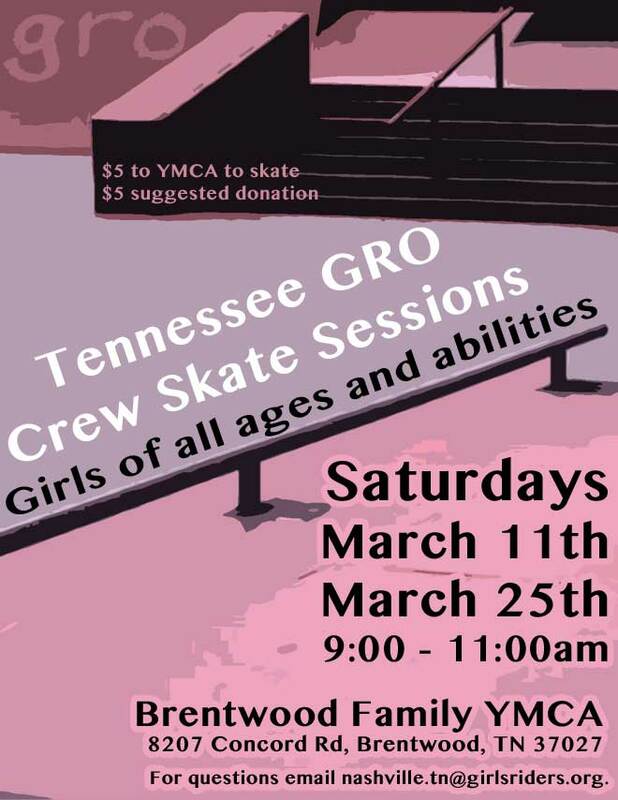 You can come skate, learn more about skating, meet other girls sharing your interests and most important, find out how you can become and important part of this GRO Crew as a GRO Rider, supporting parent, sponsor or volunteer that all work together to build girls and the opportunities for them in and around Nashville! * Waiver will need to be completed onsite for each rider or click here to find the YMCA waiver online. Contact Samantha at 678-634-2263 or Nashville.TN@girlsriders.org with any questions.